You've got to admire Tony Upton in this day and age of everything being electronic, fancy, complicated and not necessarily performing the intended function…even though it may look impressive. Tony has stuck to the plain ol’ simple and practical ideals that see’s his Biji Barbi doing its job without fuss or fanfare. “rough enough for the bush” as he puts it… solid and functional without the glossy flair of posers is what I reckon. Now I’ve got to admit that I’m a bit of a BBQ-aholic. Not only do I like to cook on them, but I’ve got more BBQ’s than you can poke a stick at. Square ones, round ones, big and small – I’ve tried ‘em all. We spotted a fellow camper using a Biji Barbi while on Fraser Island recently, and yep, you guessed it, I had to have one as soon as we got back home. The simple, no-nonsense design and compactness is what has me thinking that this could well be the best travelling BBQ I’ve ever seen and used. The flip-open legs and handle take next to no time to…well…flip open to have the Biji Barbi ready to cook whatever culinary delights you deem fit for the bush or even in the backyard – that’s where we used ours the first time for bacon and eggs for Breaky. Once the legs and handle are folded shut, the whole kit is thin enough to slide under the seat or in the back cargo area taking up next to no room. There are two sizes of Biji Barbi – medium (350mm in diameter) which Tony tells us is ideal for those cheap-to-run portable butane cookers and large (430mm in diameter), which we opted for. 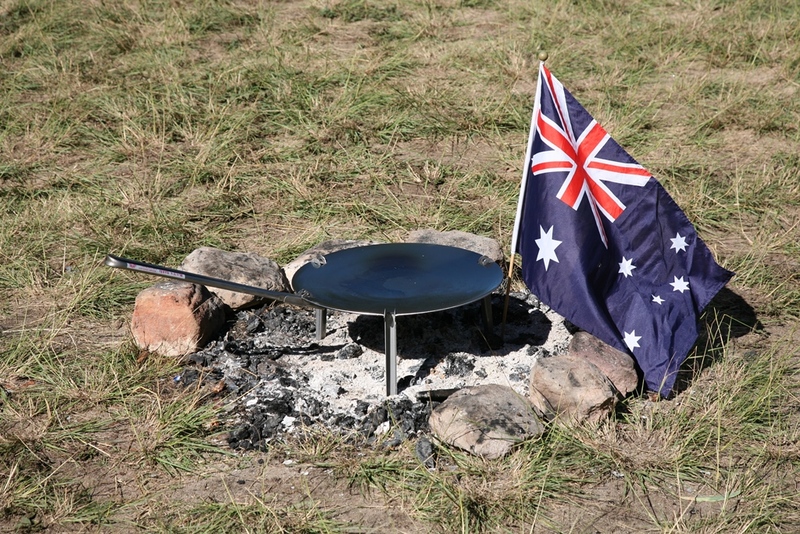 While the larger version has longer legs and puts the plate further away from the butane cooker, it still gets hot enough to cook and you can always chock the cooker with a piece of timber if needed to bring the flame closer. The larger version also has a slightly thicker metal plate at 3.0mm compared to the medium one at 2.5mm. If your not one to cook on gas, the Bidji Barbi can always be used on the open fire or coals. The long handle is ideal for moving the plate without burning your hands – still be sure to wear gloves though! Of course, neither of these sized plates are large enough to feed the masses, but they’ve got enough girth to them to feed a modest family or a few mates. Tony also knocks up a simple canvas cover, out of which protrudes the Bidji’s carry handle – clever! He also supplies his Barbi’s with an optional sliding tool rest onto which sits your tongs or his own optional flip grips – again a bloody simple solution to keep your tools out of the dirt! Tony uses plain old mild steel for his plates, no fancy non-stick surfaces to accidently scratch and nothing to break or crack. His extremely clever fold up leg and handle system is pure art in its simplicity and workings – so much so that’s it’s a patented design. Tony tells us the ‘round shape’ originates from early days of farmers trying to use old plough discs to cook on. I’ve had a go at these too, but reckon they have too much curve (or dishing) in them – ever tried to fry and egg or cook pancakes on a large-dished surface. It’s bloody hard when everything dribbles to the centre! Tonys design does have a slight dish, but it’s just right for most cook-ups. Of all the different BBQ’s I’ve got, it’s the Biji Barbi that’ll be permanently packed in behind the cargo barrier so we never get caught without something to cook on. Good on ya’ Tony for keeping life simple, you’ve obviously done your fair share of cooking in the bush!